Kentucky FFA wins National FFA contest for sixth straight time. Spencer County FFA: Coach Bland Baird, Evan Stilts, Jackson Shelley, Noah Dunning, Sydney Warren (3rd Individual), and Amelia Floyd (High Individual). The National Dairy Cattle Evaluation and Management Contest Career Development Event (CDE) took place last week in Indianapolis, Ind., during the National FFA Convention. 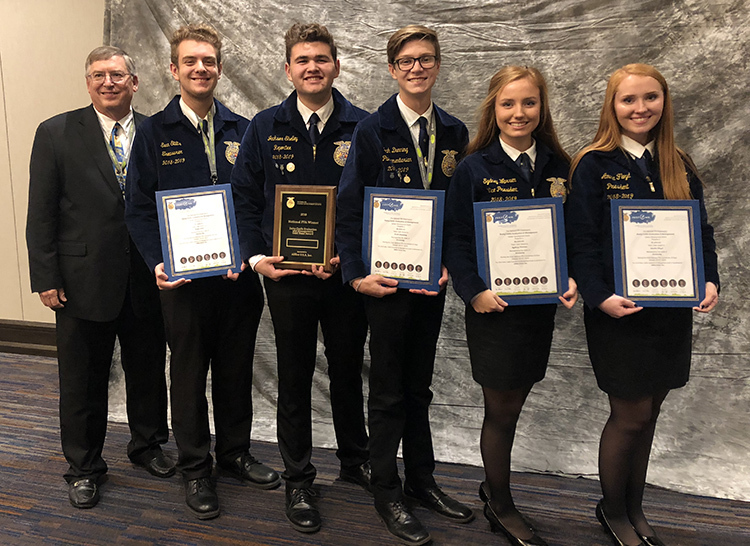 The team from Spencer County FFA in Kentucky captured the title for the sixth straight year with a healthy 17-point advantage over California’s Modesto FFA. California FFA’s high ranking was garnered by receiving the highest score on the team presentation. The team from Osceola FFA in Wisconsin took third. The top three teams at this contest are invited to participate in the Royal Highlands Show in Scotland next summer. Houston County FFA in Georgia placed fourth and won the All-American Dairy Judging Contest two weeks ago in Harrisburg, Pa., with the same team members. 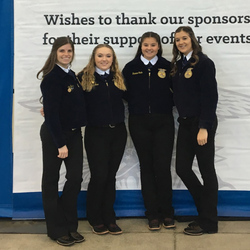 2nd Team from Modesto FFA in California: Amy Bavaro, Aspen Silva, Shianne Omlin, and Sierra Omlin are from Modesto FFA. The top four teams each had all four members receive Gold Medal recognition. Rounding out the top 10 teams were Tillamook FFA in Oregon, Lynden Christian FFA in Washington, Eastern Hancock FFA in Indiana, Tri-City United FFA in Minnesota, Filer FFA in Idaho, and Lincoln County FFA in Tennessee. Kentucky’s team consisted of three of the top four individuals. With 530 points, Amelia Floyd had a decisive victory with a 15-point margin over Mikayla Peper of Wisconsin’s Osceola FFA. The Kentucky FFA pair of Sydney Warren and Evan Stilts tied with 512 and placed third and fourth, respectively. The edge went to Warren who had the advantage in oral reasons, where she topped the field of 141 participants with a 45.3 average on three sets of reasons. Fifth-place individual went to Wisconsin FFA’s Marie Haase, who also earned the highest score on Wednesday’s written exam. Sierra Olmin from California FFA placed sixth. All tied with 504 points were Claire Delohery of Connecticut FFA, Juli Dickinson from Washington FFA, Josh Seals from Oregon FFA, and Grace Howe from Iowa FFA. Atley Miller of Francis Scott Key FFA in Maryland was high individual in Brown Swiss, Amelia Floyd of Kentucky FFA won Ayrshires, and Sierra Omlin of California FFA won Holsteins. 3rd Team: Osceola FFA in Wisconsin: Kristi Getschel, Marie Haase, Mikayla Peper (2nd Individual), and Grace Haase. Individual scores are a combination of classes, reasons, the written test, and Dairy Herd Information (DHI) record evaluation. The team presentation score does not factor into the individual rankings; it is only added to a team score. Kirsten Langmaack of Charlotte FFA in Michigan FFA won the dairy handlers event, which is held concurrently with the judging portion of the Dairy Cattle Evaluation and Management CDE. The contest includes a written test on dairy management, evaluation of DHI records, six classes of dairy cattle to judge, three sets of oral reasons, and a team activity that includes evaluating a farm and providing feedback in the form of an oral team presentation on a farm’s nutrition program. 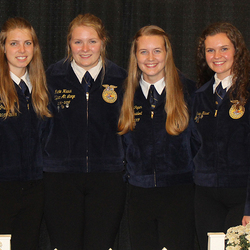 The topic of the team presentation changes each year and is similar to the popular National Dairy Challenge, but FFA members do not visit a dairy. They review images and documentation from the operation. View past winners here since 2001.